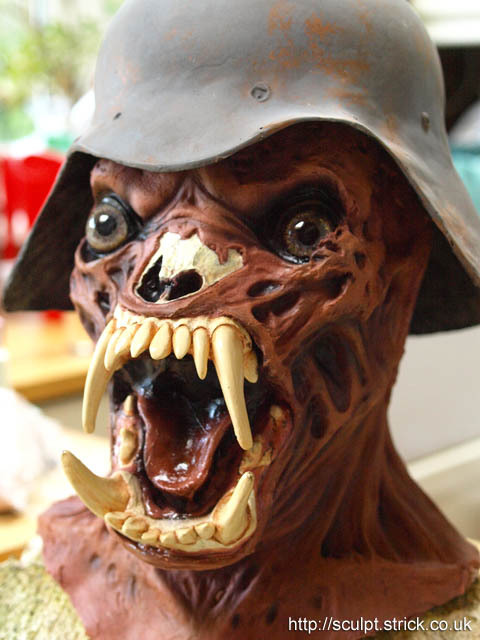 Originally described to effects artist Rick Baker as 'Nazi Demons', Baker realised the nightmare creatures in An American Werewolf in London by creating a range of pull-on rubber masks. 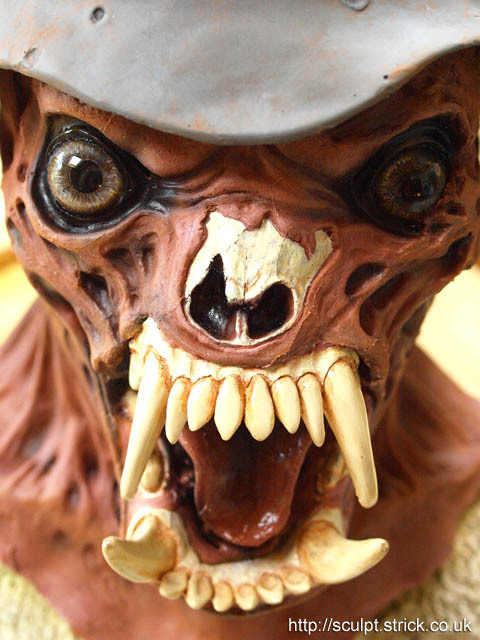 In my opinion, one of the most striking creations was the 'zombie werewolf' (also known as the War Demon). Recreating the creature in this case was rather a rush-job as I only had three weeks of weekends and spare time to complete the project, necessitating some cutting of corners. 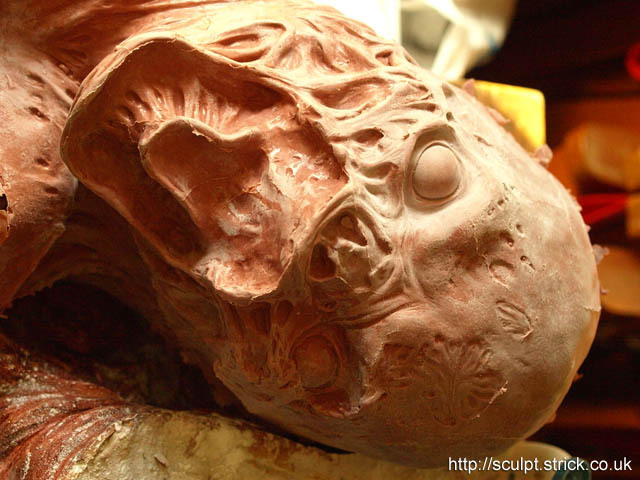 I sculpted the head using a blend of Roma and Newplast oil-based clays on an old lifecast left over from a previous project. I had gathered together as much reference material as I could, but had very few clear images of the original creature. This made reconciling the various angles into a three-dimensional model quite a challenge. 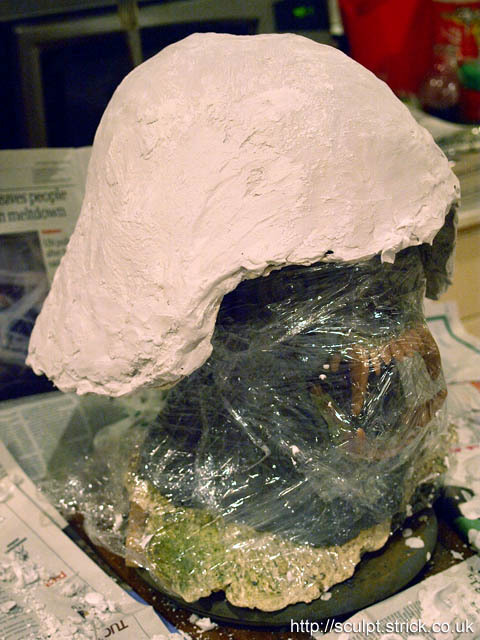 A plaster mould was built up over the helmet using Herculite 2. 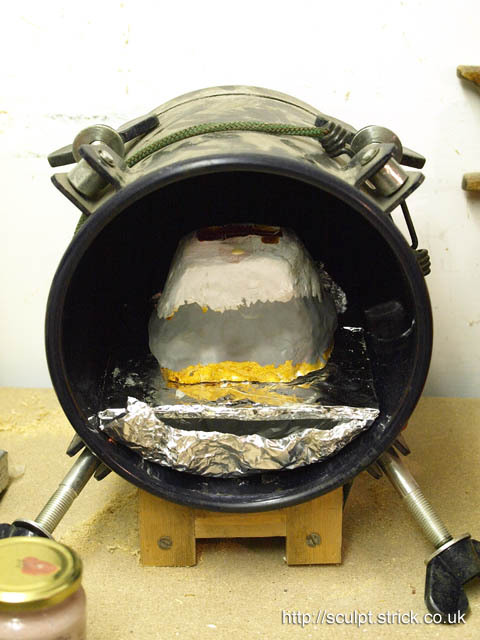 The helmet mould was treated first with two coats of shellac and then waxed with several coats of beeswax. The mould was coated with a layer of gelcoat. Once this was tacky, it was painted with fibreglass resin and sections of fibreglass matting that had been precut to fit were laid on. 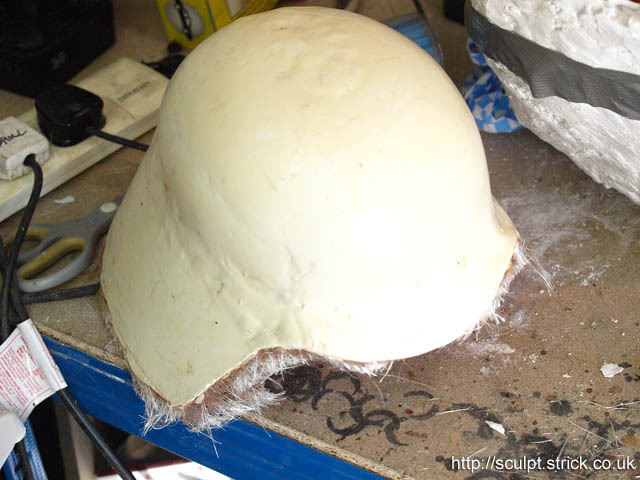 After the resin had cured, the helmet cast was worked loose from the mould. I was pleasantly surprised to find that despite the slight undercuts, I was able to remove it and leave the mould reasonably intact. The helmet was then trimmed and thoroughly scrubbed before being rubbed down with wet/dry paper. A strap was riveted into place. 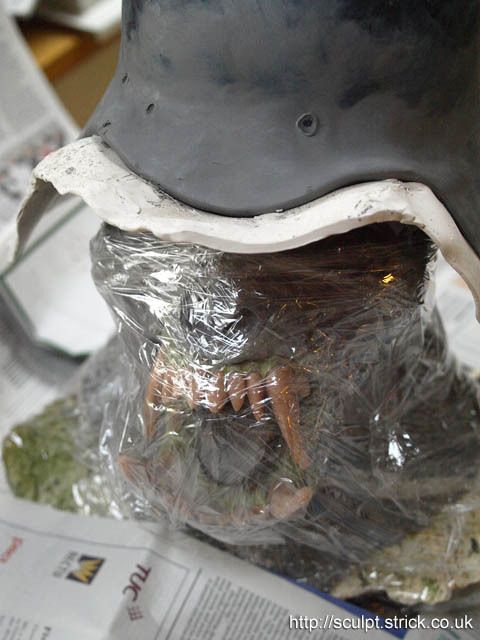 I then sprayed the helmet with plastic primer before finishing it with acrylic paints. 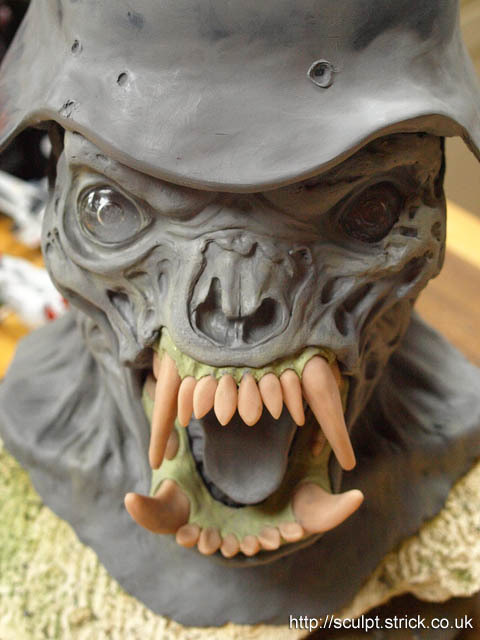 I initially made each tooth individually in Super Sculpey which was then oven-cured. 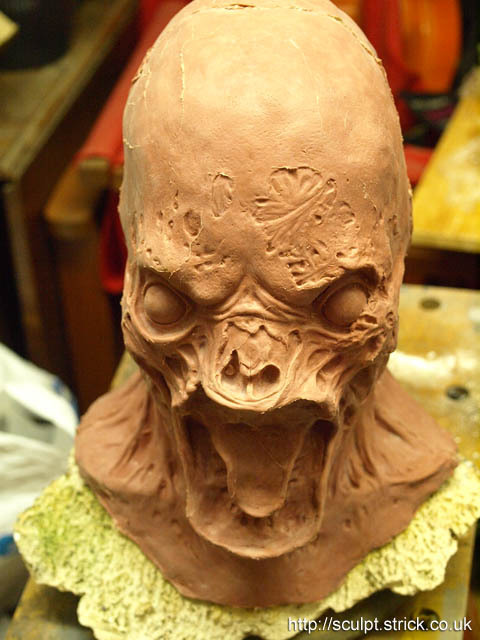 I then built the gums (or more accurately the mandible portion of the skull, since the gums were supposed to be rotted away) in place on the clay head using Milliput, inserting each tooth as I went. Once the Milliput had cured and the rest of the sculpt was complete, the teeth/gum assemblies were carefully removed from the mouth. The extreme angles of the teeth made for a challenging mould design, but I decided on a two part silicone mould with a plaster support shell. To make the plaster shell, the teeth were first embedded in clay where the first half of the mould would be. On top of this, I added a layer of rolled clay over the teeth. This area would later be replaced with silicone. I also added clay keys which would hopefully help the shells align, as well as a pouring chimney. I mixed Herculite 2 plaster to the consistency of whipped cream and applied it over the clay leaving only the outer edges of the keys and the top of the pouring chimney uncovered. Once the plaster had set, the mould was flipped over and the clay stripped out. 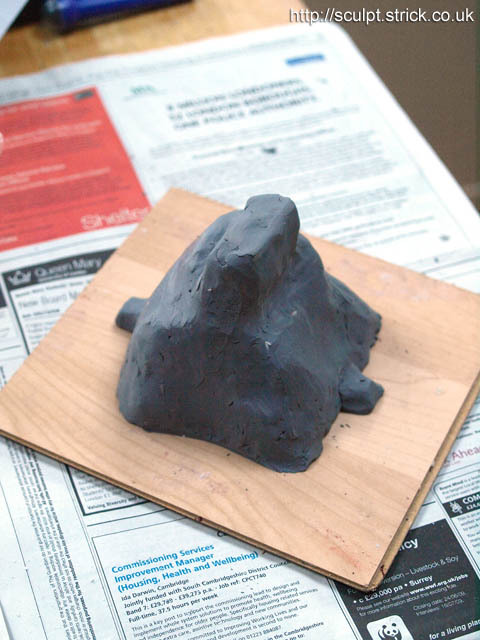 The mould was lined with a new layer of rolled clay. 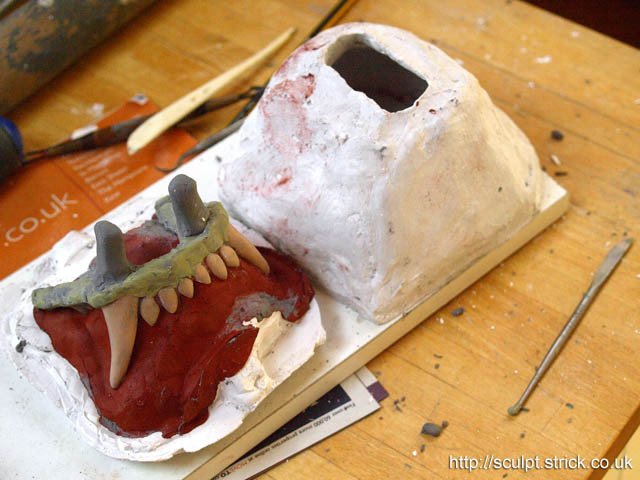 The teeth assembly was inserted on top, and an additional clay layer added to cover it. Two tall pouring chimneys were added so that they would extend into the chimney in the plaster shell. I then brushed petrleum jelly over the exposed plaster. The second half of the plaster shell was now built up over the first half and the clay. Pouring holes were drilled out with a masonry drill after the plaster had cured. With the plaster shell complete, the first half was once again lined with rolled clay and the teeth were carefully embedded, following the edges of each tooth to ensure that the two halves would release correctly. 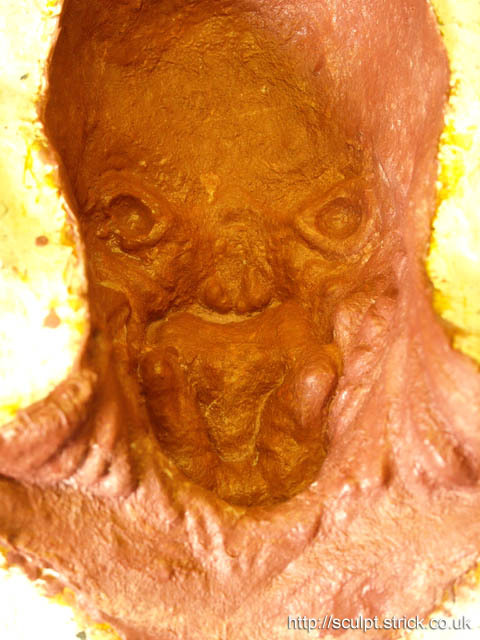 The clay and teeth were sprayed with mould release. The mould was closed and the dividing edges sealed with clay. A batch of RTV silicone was made up, with 5% silcone fluid added to improve flow and poured in via the pouring chimney. The mould was then vibrated for several minutes to release any bubbles, using a power drill with an off-centre attachment in the chuck. 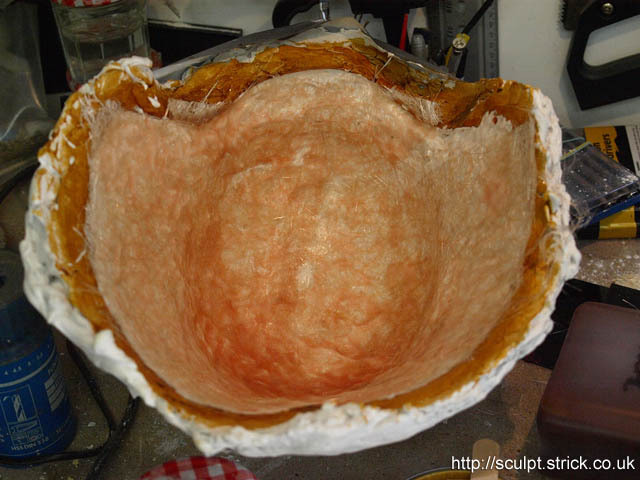 The mould was then placed in a pressure tank at 40PSI until the silicone had cured. 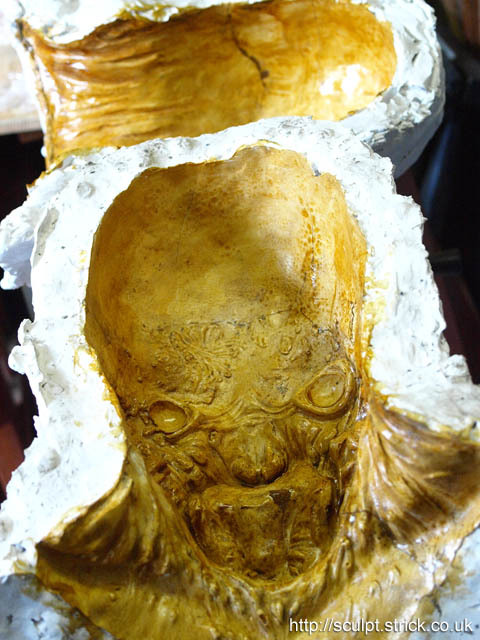 After curing overnight, the mould was inverted, opened up and the clay carefully removed leaving the teeth embedded in the first half of the silicone. 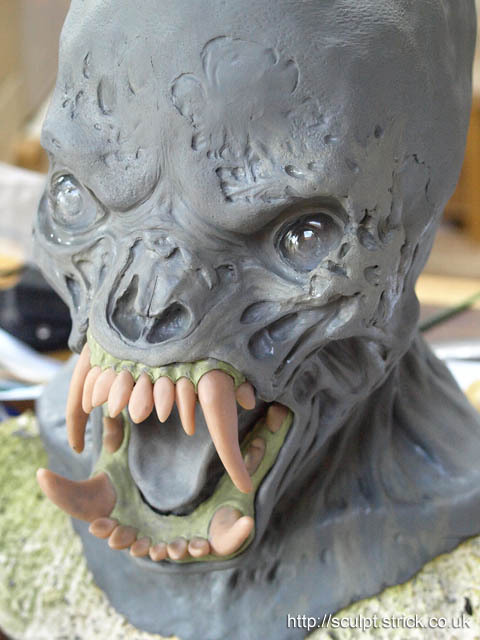 The teeth and silicone were sprayed with mould release. 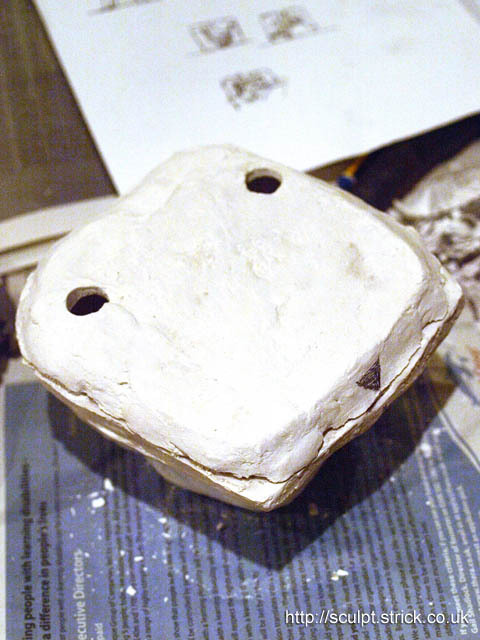 The mould was closed, sealed with clay and a second batch of silicone pured in through the pouring holes. The mould was vibrated and then returned to the pressure tank overnight. In case of any accidental resin leakage, the plaster cases were coated with shellac and then beeswax. They were then closed up and sealed with clay. 125ml of clear polyester resin was mixed with 4ml of ivory pigment and 50 drops of catalyst added. This was poured in a steady, thin stream into one of the pouring chimneys once the resin reached the top of both chimneys, the mould was placed in the pressure tank overnight. Examining the outside of the mould, it was evident that thinner areas of the resin had not completely cured due to being unable to build up sufficient exotherm. The mould was therefore placed in a fan assisted oven at 140 degrees for 90 minutes to heat cure any remaining thin parts of the cast. I built a clay wall around the sculpture dividing the front and back sections. 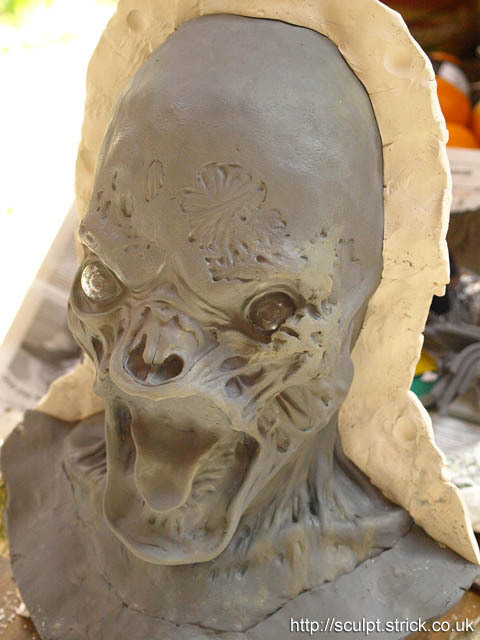 I then covered the front of the head with Herculite 2 plaster. Once the front plaster half had set, I stripped off the dividing clay and added some wedges that would later provide access points for prising the two halves apart. The edge of the front half was coated with petroleum jelly. I then built up the plaster for the back half. I mixed an approximate decomposing flesh colour in latex pigment and stirred it into around 250ml of prevulcanised liquid latex. I applied two coats of this over each half of the mould. I then mixed up an identical batch of pigmented latex, this time adding a thickener. Two coats of thickened latex were applied to each half. Next I used thinner pigmented latex to stick overlapping squares of single-ply tissue into each half forming a kind of latex papier-mache. I repeated this with a second layer. The two halves were then reassembled and the seam filled first with thickened latex, then using the tissue technique. Talcum powder was blown into the opening of the mould, and the edge was peeled away. Further talcum powder was blown between the mould and the rubber. The rubber was carefully fully detached from the mould, blowing powder in periodically. I was relieved to find that it released cleanly even from the deepest parts of the mould. The mask was throughly washed in warm water. 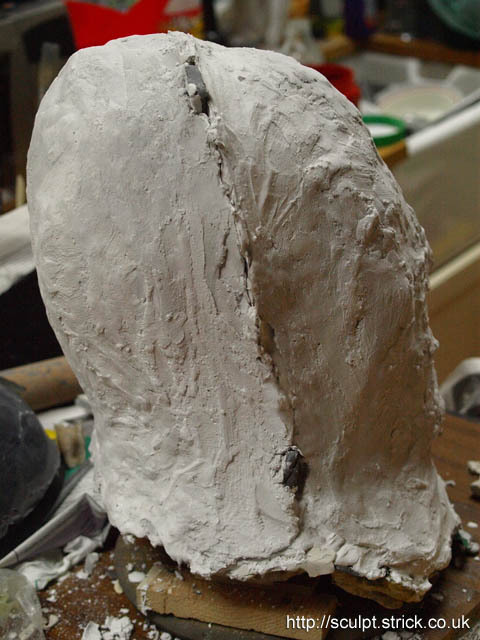 Next, the mask was trimmed and the exterior seam filled with thickened latex. 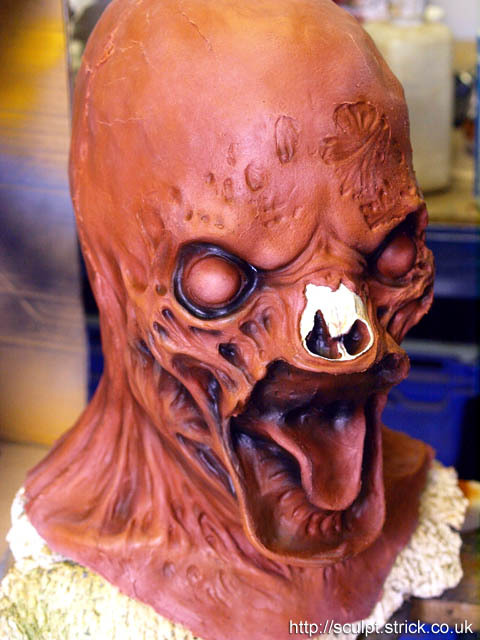 The mask was airbrushed using pax paints mixed from liquid acrylic, airbrush medium and prosthetic adhesive. The teeth were fixed into place using epoxy glue and self-tapping screws. I used clear acrylic domes from a taxidermy supplier for the eyes. These have the advantage of an inner lens-recess that gives a nice highlight on the pupil. I painted the irises on the inside of the domes using acrylic paints. The eye holes were cut out with a scalpel. The inner edges of the eye lids were beaded with prosthetic adhesive and the acrylic eyes slipped into place. Once the adhesive had dried, the eyes were reinforced on the inside with a layer of latex and tissue. More pictures of both the completed mask and the full costume here.